It is necessary to assess your current level of service delivery to consumers who are hard of hearing and late deafened to be able to develop a strategic or action plan for provision of quality services to existing, unidentified, and emerging consumers who are hard of hearing and late deafened. In order to determine how to structure or restructure program, you must know where the VR program for consumers who are hard of hearing and late deafened is currently, where the gaps are, and what outcomes it wants to target. Based on assessment information, short and long-range priorities and goals can be set, rather than stopgap measures to put out fires. Assign a lead person to develop an assessment plan and present it to agency senior management to gain approval to proceed. At first it may look difficult to carry out such an involved assessment and follow-up plan. Be assured this has not been the experience of state coordinators who have already followed the process. In fact, they have found that it is not only a user-friendly process, but as a side benefit, provided them insight into planning, program evaluation, and the ability to monitor and keep their thumb on the pulse of their program. The State Coordinator for the Deaf, Hard of Hearing, and Late deafened (SCD/HH/LD) is the logical person to lead, and keep on track, the assessment and strategic plan development. If the state does not have a SCD/HH/LD on staff, another administrative office staff person should be assigned. 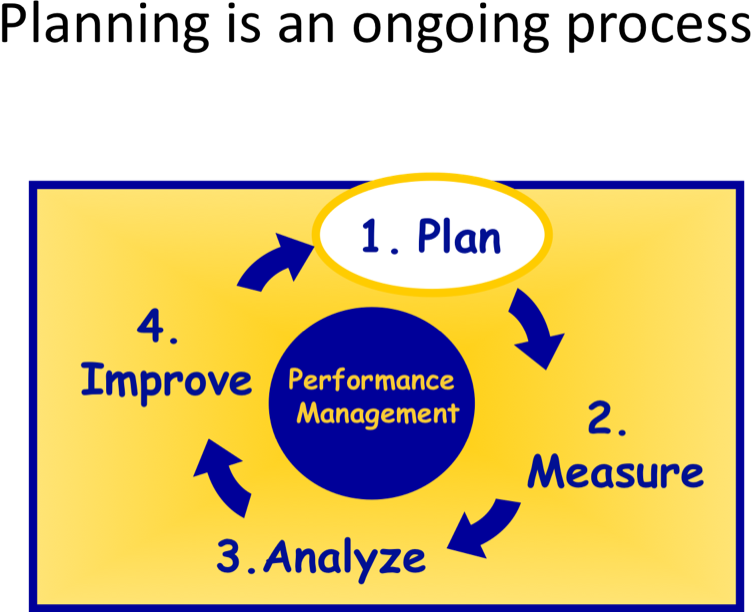 To be successful, program assessment and strategic plan development must be an administrative priority. Results of the assessment must be fully understood by senior management and recommendations for program enhancement discussed, modified, and approved by them prior to strategic plan development. All levels of management must commit to the finalized strategic plan, outcome goals, implementation steps, persons responsible, and anticipated time frames. They must communicate their desire for full cooperation in the assessment and associated strategic plan implementation to all levels of staff statewide. 2. 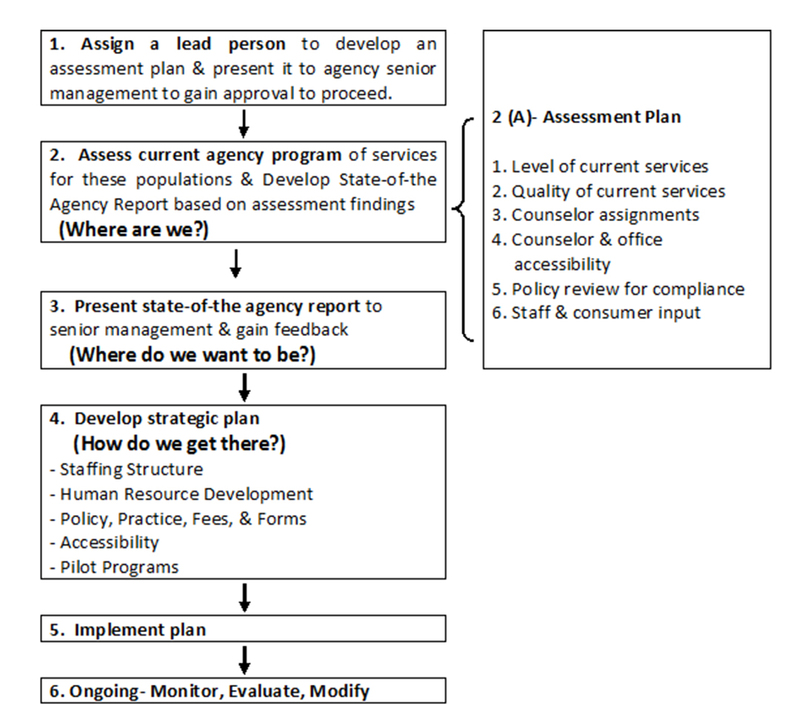 Assess Current Agency Program: Where are we? The State-of-the Agency Report should analyze assessment data, reports, survey and interview responses, policy and practices issues, etc. Collate the information into charts and other summaries to highlight trends and describe current program strengths and needs for serving consumers who are hard of hearing and late deafened. Finalize the report with recommendations for program enhancement. Definitions of hard of hearing and late deafened. Estimated state population (hard of hearing, late deafened) compared to numbers served by agency. Numbers of hard of hearing and late deafened currently served vs. total consumers served (all disabilities). Consumer characteristics (age, education, ethnicity). Number of successful closures vs. total (all disabilities) closed. Average cost per case vs. total (all disabilities) served. Number of hearing aids purchased. Were they single-service cases? National 26 closure trends vs. state closures. Caseload distribution of hard of hearing and late deafened consumers by office. Communication access and technology use/need/ provision. Quality of current services (per case reviews, staff and consumer input). Staff qualifications and accessibility (those serving consumers who are hard of hearing and late deafened). Policy and practices compliance with the law. Order of Selection standards, priorities and impact on target population. See an example of an assessment report with recommendations. 3. Present State of the Agency Report and Recommendations to Senior Management and Gain Feedback: Where do we want to be? Submit the completed state-of-the-agency report and recommendations to senior management prior to meeting with them. This will give them time to review and formulate questions and opinions prior to meeting with you. Prepare carefully for the meeting. Do your homework. Have preliminary data and focus questions prepared. Be prepared to present potential solutions to problems or to further justify recommendations. Take careful meeting notes and verify their accuracy with meeting participants. 4. Develop a Strategic Plan: How do we get there? Develop a strategic plan that includes short and long-range goals, activities, action steps and timelines needed to achieve agreed upon staff and program modifications. Goals should be written with anticipated measurable outcomes and person(s) responsible for goal completion. The finalized strategic plan must have the understanding, approval and commitment from the top of the agency — through all levels of staff — to the counselor. If only counselors are oriented, uninformed supervisors with different interpretations and opinions could undermine the new paradigm. Role of State Coordinator for the Hard of Hearing and Late Deafened (SCD/HH/LD) or other administrative staff person assigned to the initiative. Counselor assignments statewide to appropriately accommodate consumers who are hard of hearing and late deafened. Annual training plan by job title: SCD/HH/LD, RCD/HH/LD/, general counselors, bilingual counselors, clericals, receptionists, supervisors, CAP staff, and vendors. 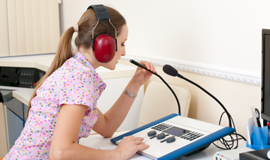 Audiological and hearing aid evaluation procedures, fees and forms. See an example of a strategic plan using this model. After Strategic Plan approval by administration, it is ready for presentation to the field. The person appointed as strategic plan implementation lead, must be totally immersed in the rationale and details of the strategic plan and committed to achievement of the desired outcomes. He or she must have an extensive background in VR of consumers who are hard of hearing and late-deafened, and be committed to provision of quality services for each. He or she must report to a person with sufficient authority to ensure that strategic plan goals and activities are not undermined. The strategic plan, when finalized and approved for implementation, must be clearly communicated to all levels of staff. Everyone, regardless of perceived level of involvement, must understand what the desired outcome(s) are, the rationale, and the individual staff and field office expectations. It is important that the strategic or action plan be monitored regularly to ensure that it is on track. If not on track, the reason for delay must be identified and adjustments made. 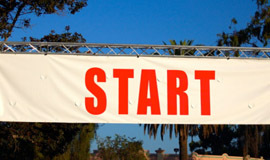 Persons critical to moving the plan ahead may need mentoring or encouragement. Circumstances may not permit progress as originally planned, or a planned activity might need modification to achieve the desired outcome. Regular progress reports (verbal and written) up and down the line are critical to keep the initiative at the forefront and on track. Develop a format for a monthly data report to track which counselors are receiving the referrals of hard of hearing and late deafened consumers, what services are being provided, successful closures, and potential models and promising practices. 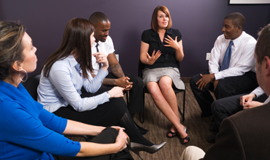 Provide regular staff meetings or other conferencing to share best practices and identify training needs. Make training available through in-service sessions and through established training programs such as the modules presented in this training package and other resources listed under Resources.